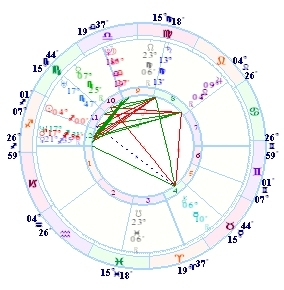 What are Synastry and Composite Charts? After the horoscope and discovery of the self, the second most popular concern in astrology is love. This certainly is not a surprise to a trained astrologer. The Self and Relationship houses contained in the personal chart are the two most prominent sections. Next, the career and family concerns are close behind for the types of questions being asked by the querant (person asking about their chart). This particular lesson focuses on relationship charts: synastry comparison charts and a variety of composite charts. The piece will not cover the interpretive aspects pertaining to love and relationships. Instead, we will discuss the methods used to assess compatibility between two people. We will use two fictitious examples: A Person, born October 3, 1981, at 2:24 a.m. in Chicago, Nebraska; and B Person, born January 19, 1976, at 4:41 p.m. in Reno, Illinois. Often times, astrologers present this information in a format that causes the reader to feel like they need to have a degree in scientific engineering to comprehend the topic. While the topic is a bit more complex than natal astrology, my goal is to break it down in a way that helps you to feel comfortable exploring it. Examples and links to other resources will be included throughout the piece to help in the learning process. All links will open in new pages and can be closed without losing this page. Some links are to off-site web resources. In western astrology, there are a number of ways to evaluate compatibility. 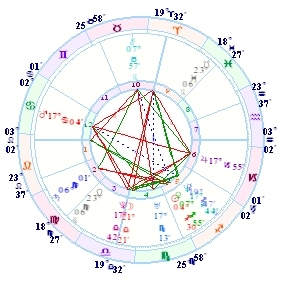 The most frequently used method is synastry or chart comparison. This is a process of comparing the two charts together. Essentially, one chart is superimposed onto another chart. The house placements of the commingled planets are reviewed for each chart and aspects are drawn between the two parties' planetary placements. One of the best ways to assess the aspects is to create a comparison grid (see example) so that you can see all the aspects better without getting tangled up with figuring out, "whose planet was that?" On the other side of the compatibility spectrum is the composite chart. The visual differences are immediately obvious. The composite chart merges two charts into one. One way to create a composite chart is to find the midpoint between each person's planets of the same type. Let me clarify that. That would be the midpoint between the same type planets, i.e. 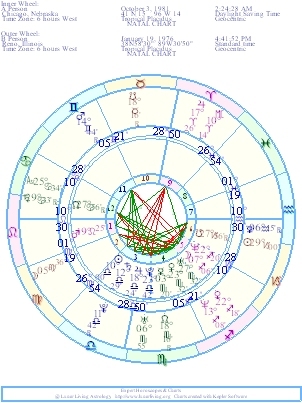 A's 10° Libra Sun and B's 29° Capricorn Sun would be 4°30' Sagittarius, but not the midpoint between A's Sun and B's Moon. There are a variety of methods used in finding the Ascendant for the composite chart. Practice and teaching usually dictates which method will be used by the astrologer. Some astrologers believe that the composite should not have houses, and rely on the natural wheel; throwing out the Ascendants and Midheavens. Other astrologers will find the Midheaven and Ascendant midpoints, then if the Ascendant falls on the western side of the Midheaven, they will flip the chart to correct the positioning. A third method uses the midpoint of the Midheavens, then finding the latitude between the two chart locations (and with the help from a Table of Houses) determine the Ascendant and house placements. This is the Derived Ascendant method. In the book, "Planets in Composite," Robert Hand recommends using the latitude of the place where the relationship was established or where the two individuals are currently living to form the Derived Ascendant. As you can see, there are a variety of ways to create the Ascendant and/or Midheaven points. From there, the individual houses are established based on the house system chosen. Thanks to computers, this task is a whole lot easier. One last type of composite chart is the "Time and Space." A quick comparison with the composite chart above is that the planet placements are not as a result of midpoints. This chart is formed by finding the midpoint in time between the two dates and the midpoint between the two locations; casting a chart for that date, time and location. The difficulty is making certain that you use the correct time zone for the midpoint location. The example time and space composite results in November 26, 1978, 9:32 a.m., 92°W52, 40°N06. The nice quality about the Time and Space is the ability to use secondary progressions. This style of composite chart is gaining popularity. While the synastry comparison chart looks at all the aspects formed from the planets in one chart to all the planets in the other chart, the composite chart first creates a single chart of planets, then the aspects and planetary placements are analyzed similar to the analysis of a natal chart. The question I get asked a lot is, "Which is better." Comparison and composite charts are not simply for love matching. Parents and children can be compared. Even siblings, co-workers, business partners, and roommates can learn a lot about how they interact with each other. Lunar Living Astrology offers a selection of computerized love and relationship reports. The charts can be wonderful tools for understanding each other and can also guide the individuals when making joint plans, choosing dates for making decisions, and generally finding the most auspicious times to accomplish joint activities. The charts can highlight how the individual qualities and dispositions are likely to interact. A topic that is seldom discussed when looking at relationships through astrology, is the reasoning behind the investigation into the other person's chart with your own. Checking out someone else's chart in an attempt to determine whether you will like that person could get a bit tricky and even confusing. This is particularly true when both individuals are adults and interacting in adult relationships. The key to using synastry and/or composite charts is to remember that each individual is the master of his/her own destiny. You are entering into their turf, so to speak. Please tread lightly. To use the charts as a tool for deception or manipulation would not be in anyone's best interest. My recommendation is, "Just don't go there." Chart comparison and composite delineation can be a little like couples therapy. If at all possible, both individuals should be active participants in the assessment. To use the information of a person's chart in order to coerce, deceive or control him/her could ultimately create harm and can even destroy the relationship all together. The best function of relationship charts is to become healthier and happier in the process through a little bit of insight into each other. So if you do choose to compare charts with another individual, be responsible in your actions and error on the side of caution. I'm of the opinion that relationship charts should carry a warning sticker for the user. There are no guarantees. If composite charts and synastry comparisons were "fool proof" then astrologers would all be in the bestest and most wonderful relationships. But I'm not here to trick you into believing that "knowing what is in the charts" will make the relationship any better. Without getting too complicated, that's about it. The contrasts between the two basic styles of relationship charts are not difficult to understand. The mastery of interpreting the charts takes time and practice. When used correctly, the practical application of the composite and synastry charts can bring the individuals closer together through understanding of personality, temperament, emotions and goals, as individuals, and as a pair.